1. How do I know if my child is in need of orthodontic treatment? <?xml:namespace prefix = o ns = "urn:schemas-microsoft-com:office:office" />It is usually difficult for you to determine if treatment is necessary because there are many problems that can occur even though the front teeth look straight. Also, there are some problems that look intimidating and complex which will resolve on their own. Asking your general dentist is good reference, but we are your best resource since orthodontics is all we do. Our initial exam is complimentary and we would be more than happy to see your child and make any recommendations necessary. 2. What are the early symptoms of orthodontic problems? Do the front top teeth line up with the bottom? Do the top teeth protrude out away from the bottom teeth? Do the top front teeth cover more than 50% of the bottom teeth? Are the top teeth behind the bottom teeth? All these are indicators for potential orthodontic treatment. 3. What age should my child be seen by an orthodontist? 5. Can I still have braces if I have missing teeth ? 6. Is orthodontic care expensive? 7. Can you be too old for braces? Orthodontic treatment can be successful at any age. 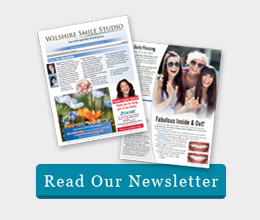 Adults definitely can have braces and appreciate the benefits of a beautiful smile. The most common definition of an adult patient is a patient with no growth. Growth can be used to our advantage in orthodontics to treat certain skeletal malocclusions. However, for the more common dental corrections, the lack of growth is not really a limitation to obtain the desired treatment results. A non-growing patient would typically be of age 17-18 years old and above. The adult teeth-bone complex has different characteristics than in the adolescent, and therefore responds in a different way to the forces applied. Although the bone is more mature, tooth movement is not much different after the first month of treatment. However, the adult patient cannot tolerate as much initial force, the adult is more sensitive to changes in occlusion, the adult has a more mature muscular functional pattern, and there are more medical problems in adult patients all of which might interfere with tooth movement and bone retention. In some adult patients, additional surgical or restorative treatments may be indicated before, during or after orthodontic treatment to treat the jaw, the gum, the supporting bone, or the teeth. Even so, adults still can benefit a lot from braces with the alignment of untidy teeth and the consequent improvement of facial appearance. Braces are also very necessary for some adults due to periodontal disease or the need of missing teeth restoration. Although many adults are now having braces, there is still a negative perception of braces not being socially acceptable or attractive. This can be decreased remarkably with advanced cosmetic materials and techniques such as: ceramic brackets (clear or tooth-colored brackets); ceramic self-ligating brackets (clear or tooth-colored brackets with specially built-in ligature part); lingual braces (braces on the inner surfaces of teeth); as well as the so-called Invisalign(trademark) technique (no brace technique). However, since every type of cosmetic braces or technique has its own indication, please consult with our orthodontists for further information. 8. What is Phase I (Interceptive Treatment) and Phase II treatment? 9. Does everyone need a Phase I treatment? 10. Can I wait on Phase I/Interceptive Orthodontic Treatment until my child is older? 11.What is Full or Comprehensive Orthodontic Treatment? 12. What is the length or duration of orthodontic treatment? 13. What are extraction and non-extraction therapy, and what are the advantages and disadvantages of each? There are many types of braces: metal braces, ceramic braces (clear or tooth-colored braces), metal self-ligating braces (braces with specially built-in ligature part), ceramic self-ligating braces (clear or tooth-colored braces with specially built-in ligature part), lingual braces (braces on the inner surfaces of teeth), as well as the so-called Invisalign (trademark) technique (no brace technique). 15. What are lingual braces? Lingual braces are mounted behind a patient's teeth. They were used many years ago, before the advent of Orthocosmetic™ braces. Lingual braces are rarely used anymore. Generally, lingual braces are more uncomfortable than standard braces. Orthodontic treatment takes twice as long and is more costly. In addition, some people have trouble talking with lingual braces. Presently, lingual braces are only used in special clinical cases.